By LUDWIG VON KOOPA - Lacking details that we'll fill in later. For all the details regarding Nintendo's E3 plans check out their E3 minisite (e3.nintendo.com) and their explanation video below. Nintendo World Championships (after a 25-year hiatus). Qualifiers May 30 at participating Best Buy retailers. Participating ones are unknown, but they'll be in major cities. You probably know if you're near one of those. Anticipate Los Angeles, San Francisco, Seattle, New York, one or two in Texas, and a southern Florida city wrongly representing the entire Southeastern United States. Update May 19: Information on the qualifiers here. The actual champion event round on June 14 that no one reading this will participate in, but you can watch it on Nintendo's Twitch channel. Digital Event June 16 (Tuesday) at 12 PM EST. In other words, same time and day of the week as last year. Treehouse Live @ E3 from June 16 through June 18. So same as last year. 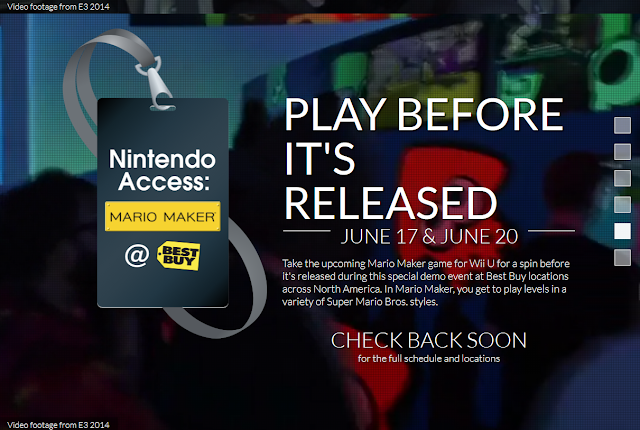 Nintendo Access: Mario Maker @ participating Best Buy retailers on June 17 (Wednesday, 4 PM to 9 PM local time) & June 20 (Saturday, 12 PM to 5 PM local time). Limited edition 30th anniversary Super Mario Bros. pins will also be distributed. Last year it was Super Smash Bros. For Wii U at Best Buy, and the year before that it was Mario Kart 8, The Legend of Zelda: The Wind Waker HD, Super Mario 3D World, and Donkey Kong Country: Tropical Freeze at Best Buy. ...So I've been trying to gather feedback from people and no one even bothers to respond, so I'll pose it here: Does anyone out there actually want to go out to a Best Buy and play Mario Maker? Really? Oh, I can't way to travel all this way for a glorified drag-and-drop level editor. Based on this press release, only major-city Best Buys will hold the World Championships. The rest of the Best Buys get the vastly-inferior Mario Maker-driven traffic, so they might not even bother signing up as many this year as they did before. Also based on the press release and the above screenshot from Nintendo's site, you will only play levels in Mario Maker, instead of... making them. That makes sense if you don't want people hogging the station for ten minutes spamming one-hundred Goombas in a line next to a Starman power-up because they don't know the first thing about level design. Seriously, there is nothing compelling about going to that Best Buy event besides filling up your 3DS's Streetpasses. Which definitely will happen, assuming anyone shows up. The crowds will definitely be thinner this year. What else to talk about? Everything else is the same as last year, but swap the Invitational with the World Championships and move it before E3 actually starts. We dunno what games the World Championships will involve, but I like to think Nintendo Land naturally lends itself to that. Oh, and the Nintendo conference is at the same time as some Square Enix one but who cares about what Square Enix has to say? in the Nintendo World Championships. Ludwig doesn't know if he'll even bother showing up to Best Buy this year for Mario Maker, assuming his Best Buy of choice even signs up this year. He definitely won't enter the Nintendo World Championships since he's a scrub and might not be near non-Reggie-Nintendo's idea of a major city. KoopaTV was SIGNIFICANTLY more excited when Nintendo announced their plans in the 2014 version of this article. They also did so back in April of 2014, compared to May of 2015. KoopaTV made a formal schedule out of this, so you can follow along KoopaTV's E3 2015 coverage. I have no interest in Mario Maker in general. The only news that I really want to hear from E3 is Square Enix announcing a western release of Dragon Quest VII and VIII for the 3ds, though I am now doubtful that the DQ VII remake will ever be released here. Well, we got an update now, which is that Square Enix moved their conference. Good luck on the localisation hopes. Woah, there could still be MOTHER 3.